Took delivery of a new 795 last Friday - I picked it up from Sea Ventures in Swanwick. Wind speed westerly 7 gusting 8. I was most impressed by the performance of the craft and its sea keeping. Amazingly stable for a lightweight boat. This must be due to its beam. My wife and I spent the weekend on the boat and were both really impressed how light and airy the accommodation is. We've been used to bigger boats, both motor and sail, in our 30 years' experience but find the 795 to be a really good all rounder. I bought the boat at the London Boat show in January and got a great deal from Sea Ventures. The whole experience from start to finish, including the handover, was exceptional. A great company to deal with. I finally took delivery of my 795 last week as well after purchasing at the Seattle boat show in February. My experience was pretty brutal from not being able to get options list to poor communication and delays by the dealer. But that's in the past now and we have logged 15 hours and couldn't be more pleased with the boat. I have it rigged up for fishing and crabbing so I'll be out in the Puget Sound looking for my hot spots. Ok, so this is something all 795 owners should be aware of to Avoid Dead Batteries. Went out to the boat last night only to find out all three batteries; engine, house, and thruster were all drained. I had made sure all the battery disconnect levers were in the off position so I didn't think that could happen given the isolation between the batteries so I called the dealer and they were puzzled as well. I had my boat at my house so I couldn't connect shore power see if the inverter would charge the battery and I coulding trailer it anywhere because the engine was in the down position. I ended up jumping the engine battery from my truck to raise the engine, but then I went to my local marine store and bought a 15A M-30A F pigtail cable (a must have if you are going to stow your boat at home) so I could plug it in to shore power at home. This got the batteries charging but it was very slow so a little more research I found the dealer did not have the inverter charging current set correctly for the model and size of the inverter so I made the change and within 30 minutes batteries were mostly charged. This unfortunately didn't explain how the batteries drained in the first place. I launched the boat and took it out for a couple hour spin and the batteries charged just fine so I knew the alternator was working. After I got back to port I began my shut down procedures and this is where it got interesting. When I went to set the battery levers to off I noticed the levers were a little loose. I turned the house lever to the left and the lever popped off. After putting it back together I noticed on the loose engine lever even though it was set to off I could still hear the engine lift motor. When I pulled the lever out a bit I could hear it turn off and that was the moment I realized what was going on. I turned the lever to the right about 10 turns and it tightened the lever handle so now when in the off position the motor battery was indeed disengaged. So the key thing to remember is, although you can turn the levers in either direction, right or left, be sure to turn them to the right to keep them tight to avoid becoming loose and ending up with dead batteries which can ruin a great day on the water. I'm a happy MF795 boater again! I had exactly the same problem with my MF645. Poorly designed isolator switches cause me a couple of sleepless nights until I realised what the problem was. I had an incorrectly wired battery isolator in my boat that meant the batteries were effectively one bank when switched on. I did not flatten the batteries but the potential was there. I now double check everything. After being out of boat ownership for over 20 years, we're very interested in getting back into it with the MF795 w/200HP Yamaha. It appears to fit almost all of our requirements, ie; not too big/not too small, OB power for economical operation and service, protection from the elements, etc. Interesting that there's no hot water option but that doesn't seem to be a deal breaker. Been doing my homework and since MF795 is relatively new to market (although the 755 was the predecessor), it's been a challenge to get as much info as possible. I was able to download an owner's manual for the 755 which has provided a good start, but there are many more questions that I hope you owners can help with. If you get the shore power option, are there 110/220 receptacles? Looking through all the photos and specs online, I couldn't find any but did notice that at least there is a DC socket on the dashboard. It's also interesting that none of the online photos show a VHF radio installed and it's not listed as an option. While handhelds have come a long way, I guess being a former member of the USCGA has taught me to have redundant safety equipment and a fixed mount VHF is one of those requirements. I'm also not thrilled with the Lowrance electronics and will ask the dealer about installing a Garmin unit w/in-hull transducer in lieu of the Lowrance. Regarding the head, I know it's only a 24' boat (including swim platform) but manual pump heads are being replaced with either electric or Vacuflush type units. I'm not one to start flushing with salt water so if Jeanneau doesn't offer a factory option as an alternate for the manual pump, I'm planning on connectiing the intake hose for the head to the drain from the sink with the installation of a diverter valve as long as the 2 hoses are in close proximity to each other and from the diagrams, it looks to be. Could anyone confirm? Interesting location for the stern cleats. Has anyone experienced unusual chafe to the gelcoat? Since this is a new brand to the USA market, were you able to get a sweet deal or did you have to pay the price for being an early adopter? We viewed the 855 last fall at one of the local boat shows and plan to check out the 695 in the next few weeks since the 795 boats that the local dealer brought in are gone. If we like the 695 (a bit small for us), and can negotiate a fair deal for a 795, we'll order the boat unseen, contingent on a sea trial when it arrives. Thanks in advance for answering any questions here as well as any advise you can bestow. OK, let me see if I can address some of your question based on my experience and setup. First off, the 695 was not a good compromise for me, it’s too small for a weekender and capacity of people I will have on my boat. To be honest I probably would have gone with the 855 if I had the budget as it just gives you that extra bit of space, but I trailer the 795 so it's pretty easy getting around. I am very pleased with the 795!! There were only two options I found for this class of boat in the US, the 795 and the Cutwater 24 outboard. I sea trialed both and while Cutwater paid closer attention to interior design and has a larger motor (300hp), the 795 performed much better hands down. I think a lot has to do with hull design and beam width. You are correct in it’s difficult to get information about the boat, options, or others experience. Much of it depends on the dealer you are working with and mine has been and still is a total disaster. From the 2nd day of considering the boat back in February I knew more about the boat than the dealer Sales person. - Out of the options I ordered, I never could find out which ones were factory or add on by the dealer, and to date I still don’t. The 795 does come with shore power and has two 115 outlets, one below the table on the left side, which is also where the main AC outlet on/off button is located. The other outlet is located under the sink, which is a ridicules location so I had the dealer add another outlet on the top side of galley. I added an 1800W inverter so I could run without having to be plugged into shore power. It’s nice, but it’s also limited as I tried to use a small Keurig and the boiler drew too much power and the inverter shut down. - No horn. That's right, the boat does not have an option for a horn which I didn't know until I took delivery. 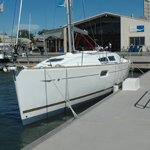 - Electronics – I ordered the boat with no electronics with the exception of the Yamaha Command Link Plus. I was told I could upgrade to the Lowrance HDS Gen3 9, which I did, but it ended up not fitting in the console so it is mounted with the brackets instead of a flush mount. I was disappointed, but the 7inch screen wasn’t going to work for what I needed. The dealer ended up installing the chart plotter, radar, and structure scan 3D. One thing to note is I wanted the radar overlay but the dealer missed the installing the rate compass which is required for radar/chart overlay so I’ll be adding that myself within the next week or so. But to your question, I don’t see any reason you couldn’t add another brand of electronics, but keep in mind the console is only big enough for a 7” unit. - Bow Thruster – This was an option I went back and forth on, but I’m glad I got it. Works great and yes I do get jabs from my other friends who don’t have one about cheating, but whatever, it’s really slick. - Added downrigger plugs and the dealer suggested to go with gimbal mounts for my downrigger instead of installing mounting plates. Big mistake, I was out last week and the first time I hit the switch to pull up my lines it pulled the rod holder an inch out of the socket and cracked the fiberglass around the rod holder. - Hot water heater – I added this, but found out after the fact that the inverter could not handle the power draw so I can only use it when on shore power. This is the one option I probably wouldn’t do again, but maybe time will change my mind. - Added cup holders: two in dash on passenger side, one on captain side, and two in the back open area. Just like auto’s, the Euro’s don’t pay much attention to comfort items as much as they do performance. - Additional USB charging port on the passenger side for phones and a fan. It gets pretty warm in the boat when stopped given all the windows. Considered AC, but it would only work on shore power anyway. - Trim tabs – the boat always has a lean to the port side so tabs would be nice to level out, and given passenger seating is also on the port side. As for deals, I wasn’t able to do much other than the boat show special, which really isn’t a special since it’s still the same price today. As you can tell, I am into fishing and rigged it as such for me, as well as keeping my wife happy with a cozy enclosed cabin! I know this was long winded, but I hope it helps you in your decision process. Thanks Ron for all the good info! We're much alike in that we do our research and it's not unusual for us to have more knowledge than the salesman! Sorry to hear of your difficulties with the dealer and hopefully your issues will all be taken care of. Since you're really into fishing, did you ever consider Eastern Boats? Fishing for us is a part time affair and the Admiral took one look and went no, but they're good boats. For a custom build, it's not that much more than a MF. The first MF we saw was an 855, very nice boat but the initial and operating cost with the twins is more than we want to spend. The Cutwater is definitely outfitted better than the MF and I also discounted that boat for your stated reason regarding handling, which is probably due to the narrower beam. Surprised the inverter shut down since I thought the Keurig only peaks at 1500 watts upon initial heating. Good to know the shore power option does come with outlets. I also took delivery of a 795, just this weekend. I've plenty of experience, and always prefer to do these type of jobs myself as it saves money and helps me to learn the boat incase something ever goes wrong. But one bit has me stumped. How the hell can I route a radar cable from the roof down to the console? I've taken out the ceiling lights, and speaker on the stbd side. But I cant get the cable down from the speaker. I know cables do run down that cavity (for the anchor light and speakers) but I cant see where they come out down below. I'm seriously thinking of taking up the floor under the sink to see if that helps. Anyone else run their own radar cable that can give me some advice? I'll also need to run the VHF cable too, as the boats don't come with VHF (not even an option). We're hoping to get to actually see a MF795 in the flesh very soon and if we like what we see, good chance will place a factory order. The dealer is pushing A/C saying that everyone wants it. Hewson commented how light and airy the accommodations are. Since the A/C would only run off shore power and we don't want to be tied to the dock forever, I don't feel this is a necessity. Do you guys feel the same? And what about the windlass option? The MF being only 24' LOA with good access to the bow along the side decks, it's not like you would be dealing with a huge anchor. Is the windlass something that makes a significant difference? Even for small light boats having a power windlass can be a major asset if the anchor really doesn't want to let go and you have strong winds, sitting on a foredeck struggling is no joke. Thanks Malcom, but I was under the impression that you should never use the windlass to free a stuck anchor since it would burn out the windlass motor. Had my 795 for eight months now and 200hrs. Goes great. Yamaha 200hp electric throttle. Isolator switches: Exactly the same problem as Captain Ron. They would work loose until the "off " position was no longer "off". A design fault. Agree need to always turn clockwise. VHF: Routed antenna cable from roof OK. It came out under lazarette starboard side forward. I installed a "black box" VHF to save console space. Bow thruster: Very useful in windy tight spaces. Has paid for itself already. Allows you to 'steer from the front'. I use it to come off a jetty when the wind is blowing on. Just move the bow out and slow idle straight ahead. Wouldn't go less than 200hp. I've got 15" pitch Reliance prop, seems about right. 20 knots @ 30l/hr. 30knots @ 65l/hr. Really great boat to spend time on and handles well when it's rough. Just need trim tabs now! Neil, you've probably sorted this by now but i checked my boat today and indeed the VHF cable exits the starboard staunchion in the forward lazarette as i thought. From there it's simple to run it forward to the console. Good luck with it. Anyone experienced waterleak from port side window? Water is running in beside the sealing inside the boat on a seat above the refrigerator. We have new MF 795 still under warranty period but our dealer has not been successful in fixing the leak until now. I have doubts that just adding sealant will not be sustainable way to correct this manufacturing default. Hi, I had my fair share of leaking on a NC11. I have experienced that water does not come in at the same place where it comes out... My dealer learned me a nice trick to establish the whereabouts of the inlet. When it is not raining take a waterhose with a moderate amount of water coming out and have one person positioned at the place inside where the water usually comes in. Let the other person outside move the hose slowly over all kit sealings on the boat until the person inside starts to yell that water is coming in. It is now easy to move back and forth to finetune where the exact leak is. Do not be surprised when it is a spot of only one or two milimeter. Thanks for your swift reply, this is exactly what we need to do 😅. I'll take up this with our dealer who is responsible of corrective measures. Can I ask still what kind of sealant you have used for fixing your leak? After thoroughly cleaning the spot I injected this kit and it still holds after half a year. I've noticed the same problem on the port side where water leaks on both sides of the window where the window angles down. I've not had a chance to take the hose to it yet, but will not in the next couple days. The dealer is coming to pick up the boat this week for other warranty work. One more item to add to the list! yes this is the case. Water running in where side window has these angles. There is frame for window in where water acculates and inlet can be where ever. My dealer has sealed all windows and even windscreen without success so far. I would be very interested to hear the outcome of your case. I took a water hose to my windows today to check for the leak and found water gets in at the front seal of the sliding window on both sides. This makes sense given I noticed the leak after a big driving rain storm. The boats going into the dealership for warranty work this week so we will see what they will do. My dealer consulted Jeanneau warranty department how to fix the sidewindow leak. Jeanneau had received similar claims and have instructions how to fix this leaking window issue. Both windscreen window frames (these black things between windscreen and side window) should be dismantled and should be replaced with the new ones they will send to my dealer. Before assembling new frames there should be used proper amount of sealant under the windowframe to make sure water will not have route inside. When my dealer dismantled windscreen window frames they noted dirt and water leaks under the frame and no sealant at all. so the problem was missing sealant under the window frames. Quite long story in my case but this fixed the leak. That's interesting and good to know. My MF795 is at the dealer for warranty work and that's one of the items I have on my list. I sent them an email with this information today so it will be interesting to see how they respond. I'm also having issues with my Windless anchor. The rope and chain continually binds in the wench when pulling up the anchor. Anyone else with that issue?